Photo-Veil from Military Wraps is a mesh material that uses images gathered from cameras on drones, satellites and lidar to camouflage military vehicles. The lightweight, customizable, foldable, portable and waterproof mesh material is also able to mask thermal and infrared output, making it ideal for blinds and ghillie suits. Camouflage differs with each battlespace. In addition, painting camouflage on vehicles has been a time-consuming and costly endeavor. Vehicles must be moved to a shop, painted and returned to the unit, which means they are not in operational service for that period. Structures had their own challenges. Camouflage painters had to go to the structure. The challenge for the company was showing others how to use the technology in the field. Help came from AS&C’s MilTech program, which enabled the company to develop a train-the-trainer course. As a result, military personnel can apply the camouflage technology in the field, and train others to apply it. It's not very clear how this material actually works. For example, is it a one-time-use material that accepts an image for a single location? Or, can it perform it's camouflage trick at the whim of its operator? 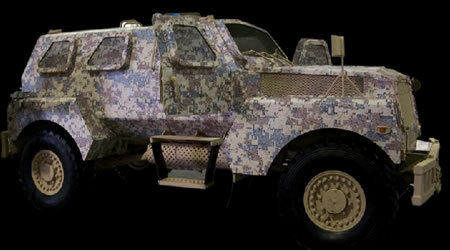 See Military Wraps and Military Wraps Photo-Veil info (pdf) for more information; via Gizmodo.